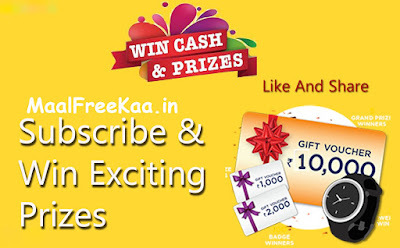 Here's Monthly Prize To Enter Online Contest For Lucky Prize Draw Giveaway and Win Cash Prize Directly In Your Bank Account Simply Who's Get Leaderboard By Sharing Daily Based And Earn Point To Get Ranked First With Cash Prize Worth Rs 5000 in your bank account and others winner win cash prize worth Rs 2000, 1000 its amazing contest this season 2nd. last time we are shared this company contest on our web and many winners received amazon gift card and much more. This is a simple raffle from DGEXP India, every entry point below gives a set number of entry points. Each Point is entered into the raffle and one is chosen at random at the end of the competition Winners of the Sweepstakes will be selected in a random drawing under the supervision of the Sponsor. Winners will be notified via email to the email address they entered the Sweepstakes with within five (5) days following the winner selection. The Winner will be chosen at the end of the contest at random among all entries. They will be informed and be sent 5,000 Rupees via bank transfer on receiving details. Person Who Receives Most Points at the end of the competition, will win this prize. Share (Maximize Points) entry method gives 1 point per referral through your share link. So be sure to share across social media using this entry method if you aim to win! Max Referral and Sharing Point Cap with Max 50 Points.